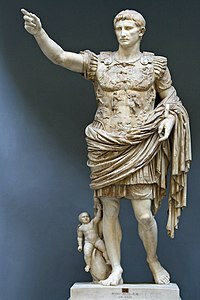 Emperor Augustus served as the first Roman emperor. His Principate ended republican rule in Rome and began Pax Romana. In the late 3rd century, after the Crisis of the Third Century, Diocletian formalised and embellished the recent manner of imperial rule, establishing the so-called Dominate period of the Roman Empire. This was characterised by the explicit increase of authority in the person of the Emperor, and the use of the style Dominus Noster ("Our Lord"). The rise of powerful Barbarian tribes along the borders of the empire and the challenge they posed to defense of far-flung borders and unstable imperial succession led Diocletian to divide the administration geographically of the Empire in 286 with a co-Augustus. In 330, Constantine the Great established a second capital in Byzantium, which he renamed Constantinople. For most of the period from 286 to 480, there was more than one recognised senior emperor, with the division usually based in geographic terms. This division was consistently in place after the death of Theodosius I in 395, which historians have dated as the division between the Western Roman Empire and the Eastern Roman Empire. However, formally the Empire remained a single polity, with separate co-emperors in the separate courts. The fall of the Western Roman Empire, and so the end of a separate list of emperors below, is dated either from the de facto date of 476 when Romulus Augustulus was deposed by the Germanic Herulians led by Odoacer or the de jure date of 480, on the death of Julius Nepos, when Eastern Emperor Zeno ended recognition of a separate Western court. In the period that followed, the Empire is usually treated by historians as the Byzantine Empire governed by the Byzantine Emperors, although this designation is not used universally, and continues to be a subject of specialist debate today. The line of emperors continued until the death of Constantine XI Palaiologos during the Fall of Constantinople in 1453, when the remaining territories were captured by the Ottoman Empire under Mehmed II. This article is about legitimate Roman emperors. For other individuals claiming the title of Emperor, see List of Roman usurpers. The emperors listed in this article are those generally agreed to have been 'legitimate' emperors, and who appear in published regnal lists. The word 'legitimate' is used by most authors, but usually without clear definition, perhaps not surprisingly, since the emperorship was itself rather vaguely defined legally. In Augustus' original formulation, the princeps was selected by either the Senate or "the people" of Rome, but quite quickly the legions became an acknowledged stand-in for "the people." A person could be proclaimed as emperor by their troops or by "the mob" in the street, but in theory needed to be confirmed by the Senate. The coercion that frequently resulted was implied in this formulation. Furthermore, a sitting emperor was empowered to name a successor and take him on as apprentice in government and in that case the Senate had no role to play, although it sometimes did when a successor lacked the power to inhibit bids by rival claimants. By the medieval (or Byzantine) period, the very definition of the Senate became vague as well, adding to the complication. Any individual who undisputedly ruled the whole Empire, at some point, is a 'legitimate emperor'(1). Any individual who was nominated as heir or co-emperor by a legitimate emperor (1), and who succeeded to rule in his own right, is a legitimate emperor (2). Where there were multiple claimants, and none were legitimate heirs, the claimant accepted by the Roman Senate as emperor is the legitimate emperor (3), at least during the Principate. So for instance, Aurelian, though acceding to the throne by usurpation, was the sole and undisputed monarch between 270 and 275, and thus was a legitimate emperor. Gallienus, though not in control of the whole Empire, and plagued by other claimants, was the legitimate heir of (the legitimate emperor) Valerian. Claudius Gothicus, though acceding illegally, and not in control of the whole Empire, was the only claimant accepted by the Senate, and thus, for his reign, was the legitimate emperor. Equally, during the Year of the Four Emperors, all claimants, though not undisputed, were at some point accepted by the Senate and are thus included; conversely, during the Year of the Five Emperors neither Pescennius Niger nor Clodius Albinus were accepted by the Senate, and are thus not included. There are a few examples where individuals were made co-emperor, but never wielded power in their own right (typically the child of an emperor); these emperors are legitimate, but are not included in regnal lists, and in this article are listed together with the senior emperor. After 395, the list of emperors in the East is based on the same general criteria, with the exception that the emperor only had to be in undisputed control of the Eastern part of the empire, or be the legitimate heir of the Eastern emperor. The situation in the West is more complex. Throughout the final years of the Western Empire (395–480) the Eastern emperor was considered the senior emperor, and a Western emperor was only legitimate if recognized as such by the Eastern emperor. Furthermore, after 455 the Western emperor ceased to be a relevant figure and there was sometimes no claimant at all. For the sake of historical completeness, all Western Emperors after 455 are included in this list, even if they were not recognized by the Eastern Empire; some of these technically illegitimate emperors are included in regnal lists, while others are not. For instance, Romulus Augustulus was technically a usurper who ruled only the Italian peninsula and was never legally recognized. However, he was traditionally considered the "last Roman Emperor" by 18th and 19th century western scholars and his overthrow by Odoacer used as the marking point between historical epochs, and as such he is usually included in regnal lists. However, modern scholarship has confirmed that Romulus Augustulus' predecessor, Julius Nepos continued to rule as emperor in the other Western holdings and as a figurehead for Odoacer's rule in Italy until Nepos' death in 480. Since the question of what constitutes an emperor can be ambiguous, and dating the "fall of the Western Empire" arbitrary, this list includes details of both figures. Assassinated in a conspiracy involving senators and Praetorian Guards. Probably poisoned by his wife Agrippina the Younger, in favour of her son Nero, possibly natural causes. Committed suicide after being declared a public enemy by the Senate. Note: all dates AD hereafter. Committed suicide upon hearing of the death of Gordian II. Murdered at Aquileia by his own commanders. Note: To maintain control and improve administration, various schemes to divide the work of the Roman Emperor by sharing it between individuals were tried after 285. The "Tetrarchy" proclaimed by Diocletian in 293 split the empire into two halves each to be ruled separately by two emperors, a senior "Augustus", and a junior "Caesar". As a private citizen, after abdication. Note: Theodosius I was the last person to rule both halves of the Roman Empire, dividing the administration between his sons Arcadius and Honorius on his death. Deposed and beheaded on the orders of Ricimer. Executed by Ricimer or Gundobad (Ricimer's nephew). Deposed in Italy by Orestes, ruled in balance of Western Empire until assassination in 480. Maintained as figurehead in Italy by Odoacer to his death in 480. IMPERATOR CAESAR FLAVIVS ROMVLVS AVGVSTVS c. 460[b] Appointed by his father, Orestes. Listed as an emperor by historical convention. His rule never extended beyond portions of the Italian peninsula. Not recognized by Eastern Emperor Zeno. October 31, 475 – September 4, 476 (in Italy) 10 months and 4 days Unknown. Deposed by Odoacer, who then ruled in the name of Julius Nepos until the latter's death in 480, which formally ended the separate Western Empire; most likely lived out his life in obscurity on a private villa. Note: The classical Roman Empire is usually said to have ended with the deposition of Romulus Augustulus, with its continuation in the East referred to by modern scholars as the Byzantine Empire. Deposed, blinded, castrated and tonsured after attempting to sideline Zoe and her sister Theodora. 31 August 1057 1 year 1059, confined to a monastery after having been deposed by successor. 22 November 1059 2 years c. 1061 after having voluntarily abdicated. Note: Between 1204 and 1261 there was an interregnum when Constantinople was occupied by the crusaders of the Fourth Crusade and the Empire was divided into the Empire of Nicaea, the Empire of Trebizond and the Despotate of Epirus, which were all contenders for rule of the Empire. The Laskarid dynasty of the Empire of Nicaea is considered the legitimate continuation of the Roman Empire because they had the support of the (Orthodox) Patriarch of Constantinople and managed to re-take Constantinople. ^ The other claimants for the throne in the Year of the Five Emperors were Pescennius Niger and Clodius Albinus, supported by the Syrian and British legions respectively. Although not completely defeated until 197, they were not formally accepted by the senate and were therefore not technically reigning emperors. ^ Romulus Agustulus biographic details. ^ Chester G. Starr, A History of the Ancient World, Second Edition. Oxford University Press, 1974. pp. 670–678. ^ Herrin, Judith (2011-03-12). "The Glories of Byzantium". Wall Street Journal. ISSN 0099-9660. Retrieved 2017-12-10. ^ Asimov, [title? ], p. 198. ^ Moss, Henry, The Birth of the Middle Ages Clarendon Press (London) 1935; Folio Society reprint (London) 1998; pp. 24-28, 281-284. ^ "Roman Emperors After Theodosius I". Retrieved 30 September 2014. ^ Anderson & Zinsser, Bonnie & Judith (1988). A History of Their Own: Women in Europe, Vol 1. New York, NY: Harper & Row. p. 47. ^ Diehl, Charles (1963). Byzantine Empresses. New York, NY: Alfred A. Knopf. ^ "(138) Leontius". www2.lawrence.edu. Retrieved 2019-04-17. ^ "Justinian II - Byzantine Coinage - WildWinds.com". www.wildwinds.com. Retrieved 2019-04-17. ^ "Philippicus - Byzantine Coinage - WildWinds.com". www.wildwinds.com. Retrieved 2019-04-17. ^ "Anastasius II - Byzantine Coinage - WildWinds.com". www.wildwinds.com. Retrieved 2019-04-17. ^ "Theodosius III - Byzantine Coinage - WildWinds.com". www.wildwinds.com. Retrieved 2019-04-17. Wikimedia Commons has media related to Index Imperatorum Romanorum. This page was last edited on 17 April 2019, at 15:30 (UTC).